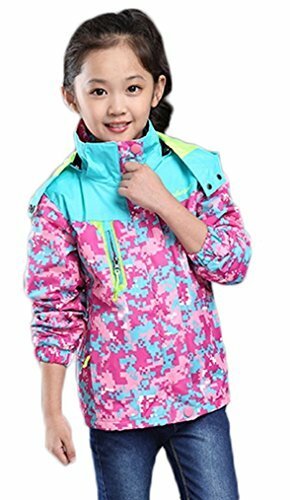 Look at this new children girl outdoor casual jacket floral zipper hooded coat removable two-piece suit, it's a very economical because it is detachable, that means you got this two-piece suit and at the same time you have two coats. This two-piece suit uses waterproof fabric, and has high collar with hood, it is removable. This design can protect your neck and head, gives you a perfect care. There are some snap button at the neck, they can windproof and keep children warm. It has zipper pocket and elastic cuffs to make the coat become useful and practical. This suit can detachable; the outside coat has floral printing, so fashionable and attractive, very colorful. The inside coat is pure color and it can be worn outside; it is wear-resisting but non-waterproof. The inside coat also has high collar, hand pockets, elastic cuffs and zipper design. Such a two-piece suit is suitable for spring, autumn and winter and perfect for lots of outdoor activities. It is a trendy and practical coat, children will like this one. High collar and removable hood give your neck and head a protection. There is snap button at the neck, has the effect of windproof, and also warm. Waterproof fabric, super soft, not bound, let the children feel free. Floral printing: wear-resisting and good-looking, makes the child more beautiful. Zip pocket with different colors, fashionable, practical and beautiful. Elastic cuffs, perfect fit the wrist, keep warm and breathable. Two-piece design: a detachable coat all can be worn outside, very special. If you have any questions about this product by Bakerdani, contact us by completing and submitting the form below. If you are looking for a specif part number, please include it with your message. La Redoute Collections Big Girls Army Style Utility Jacket, 10-16 Years Green Size 14 Years - 61 in.